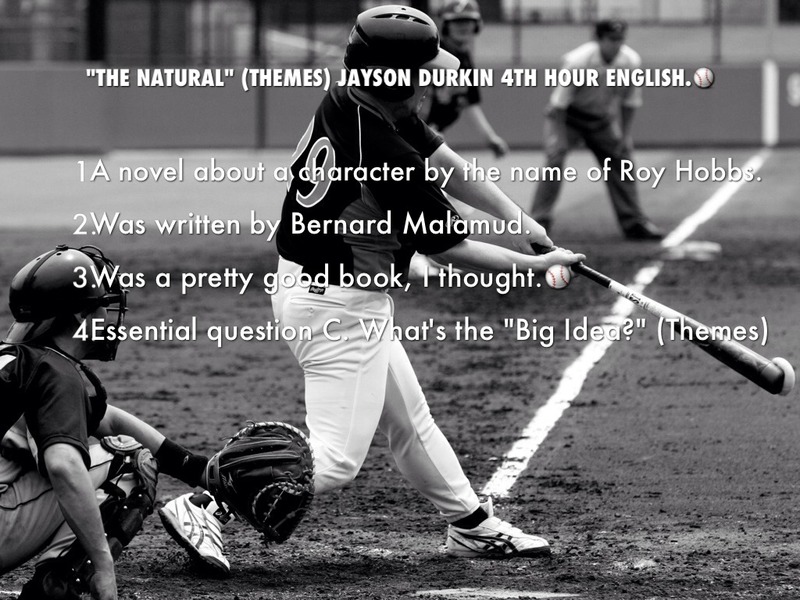 A novel about a character by the name of Roy Hobbs. Was written by Bernard Malamud. Theme-A subject of discourse, discussion, meditation, or composition. Like the moral of the story, the message and meaning. Or the unifying or dominant idea. 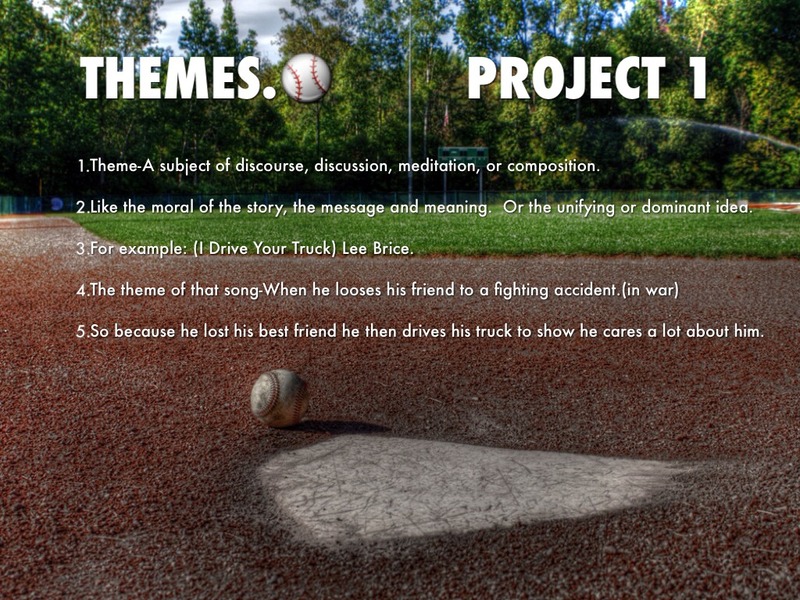 For example: (I Drive Your Truck) Lee Brice. So because he lost his best friend he then drives his truck to show he cares a lot about him. Major theme-Memo, a fish looses his dad because he gets took away by some people. He was swimming and went too close to a fishing boat and the fishers scooped him up with a net. Memos dad then continued to look for him until one day they met. 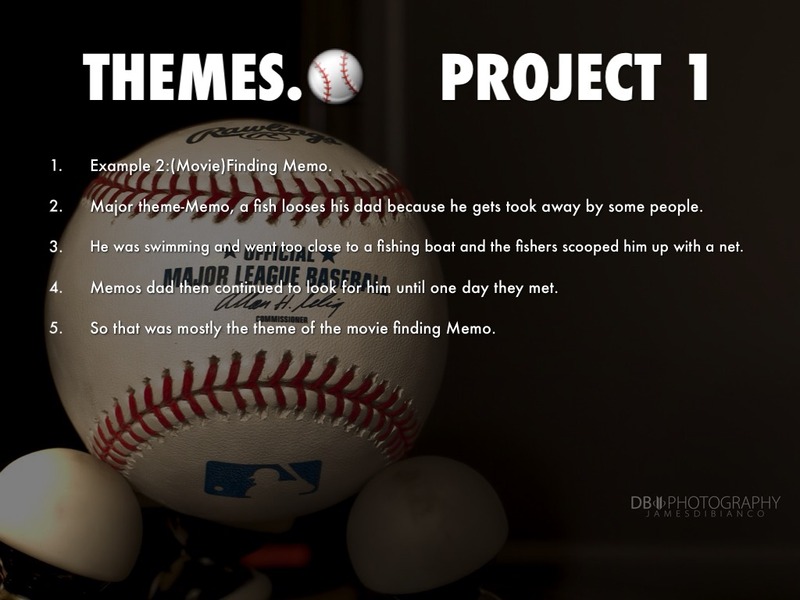 So that was mostly the theme of the movie finding Memo. 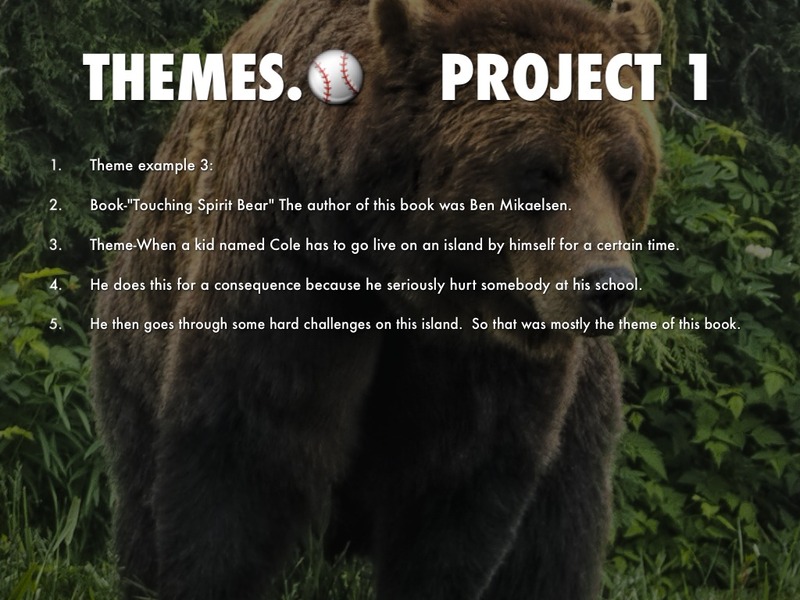 Book-"Touching Spirit Bear" The author of this book was Ben Mikaelsen. 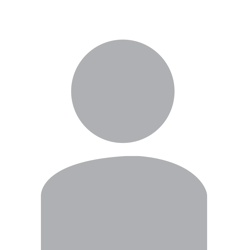 Theme-When a kid named Cole has to go live on an island by himself for a certain time. He does this for a consequence because he seriously hurt somebody at his school. He then goes through some hard challenges on this island. So that was mostly the theme of this book. 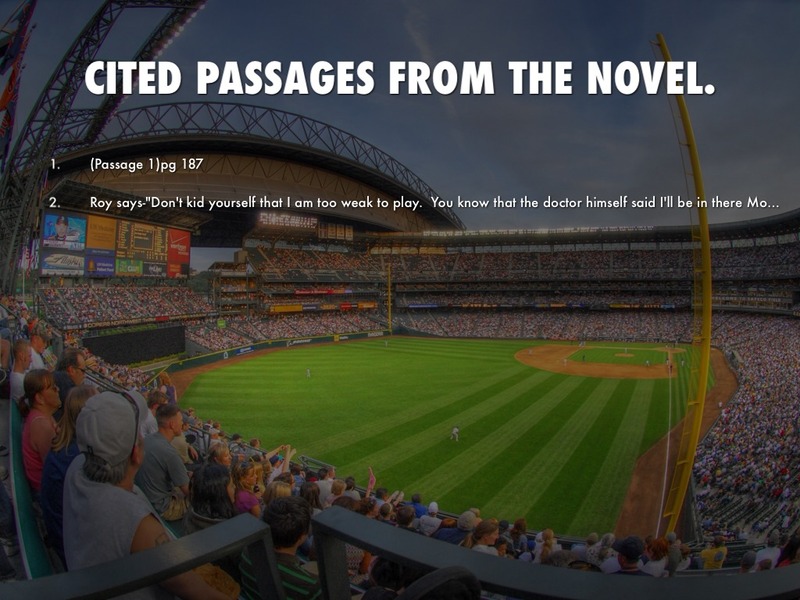 CITED PASSAGES FROM THE NOVEL. Roy says-"Don't kid yourself that I am too weak to play. You know that the doctor himself said I'll be in there Monday." "He was just unlucky," pop said, "and there wasn't a thing anybody could do to take the whammy off of him and change his hard luck. You know, Roy, I been lately thinking that a whole lot of people are like him, and for one reason or the other their lives will go the same way all the time, without them getting what they want, no matter what. Pop says-"Roy, I would give my whole life to win this game and take the pennant. Promise me that you will go in there and do your best." 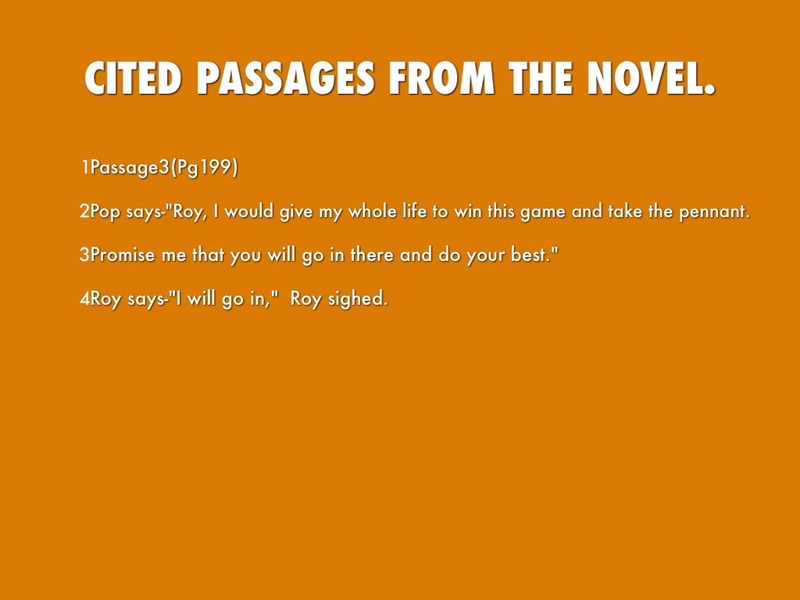 Roy says-"I will go in," Roy sighed. Pop says to Roy-"Sit down." Pop bent forward. "We can win today." His cold breath smelled bad. Roy drew his head back. "Well, we can, can't we? He nodded. "What's the matter with you?" "I feel weak," Roy said, "and I am not betting how I will hit today." Pop's voice got kindly again. "I say we can win it whichever way you feel. Once you begin to play you will feel stronger." 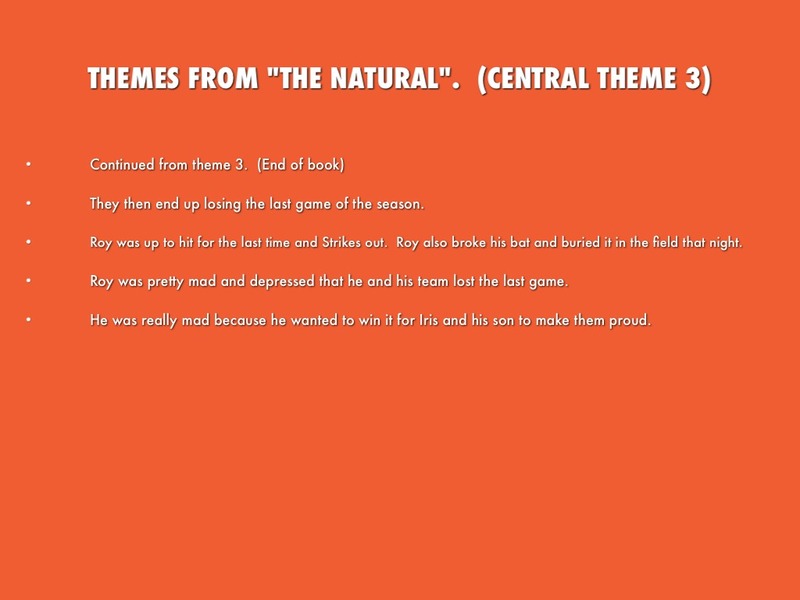 THEMES FROM "THE NATURAL". 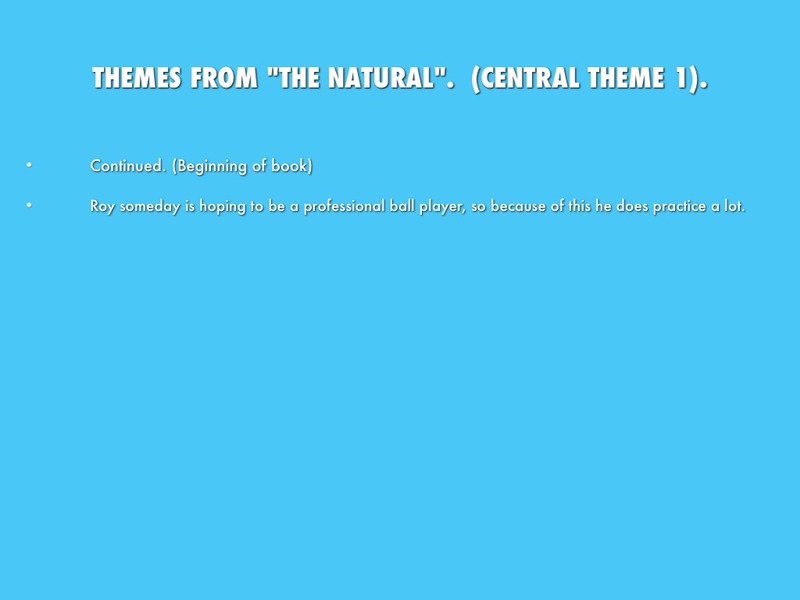 (CENTRAL THEME 1). Theme 1 (beginning of book). Roy grew up on a farm loving the sport Baseball. He carved a bat out of a tree and called it the Wonderboy. After being at the farm for a while he then moves to Chicago and does take the bat with him. It was quite a way from his home town. He is moving to Chicago to be close to the Cubs as he hopes to be one, one day. Roy someday is hoping to be a professional ball player, so because of this he does practice a lot. 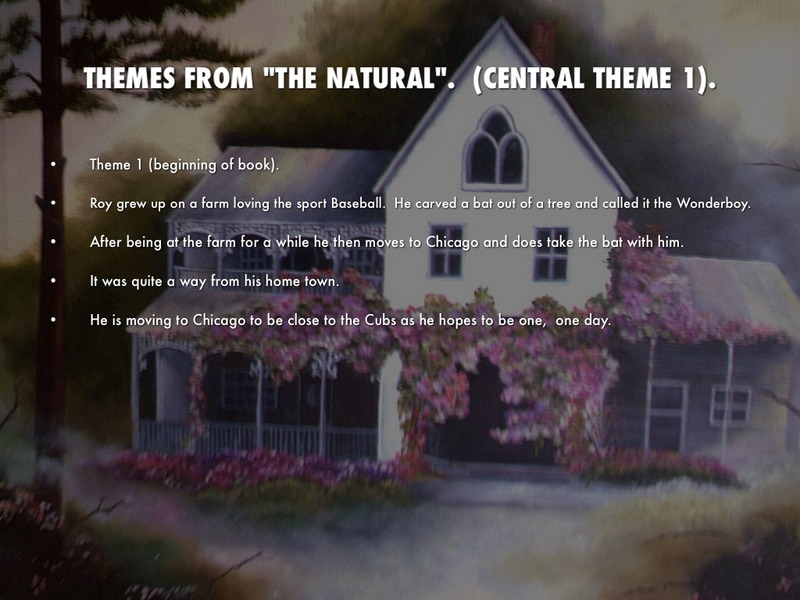 THEMES FROM "THE NATURAL". 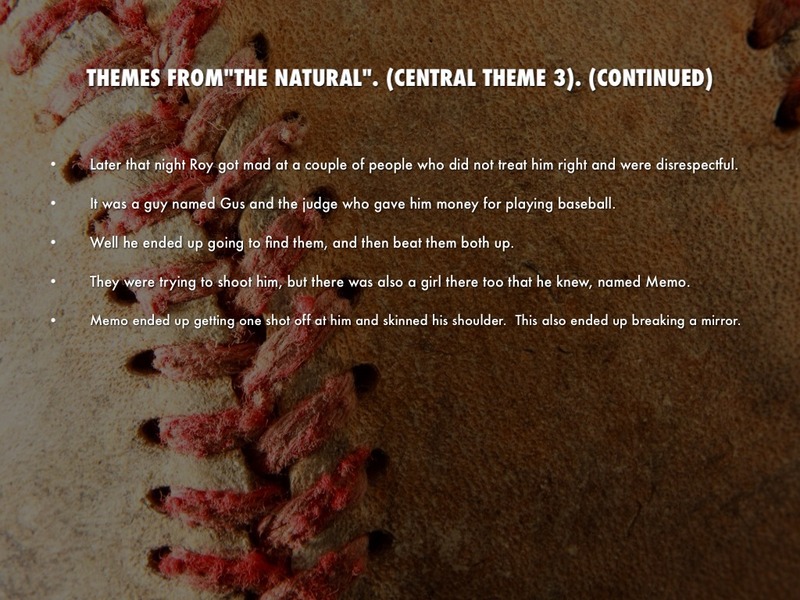 (CENTRAL THEME 2). Arrives to Chicago and gets on a baseball team. Roy gets drafted to a team called the Knights. 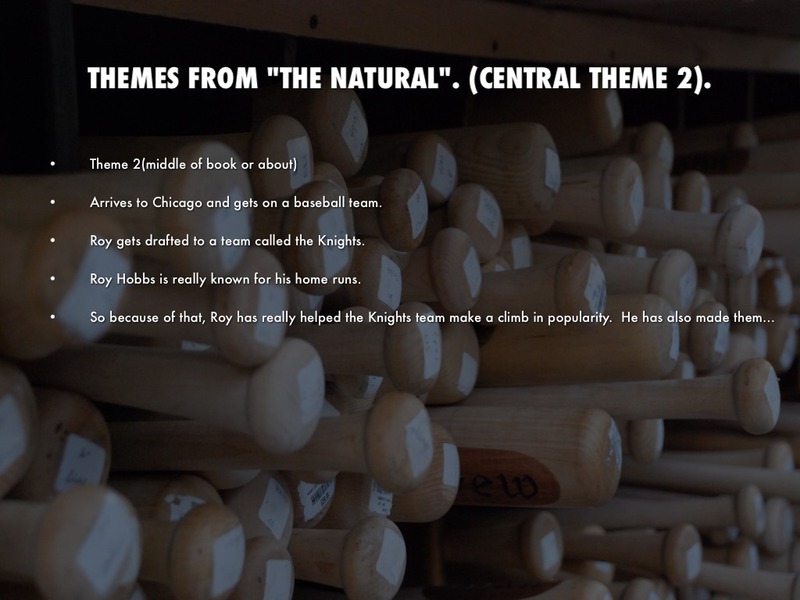 Roy Hobbs is really known for his home runs. 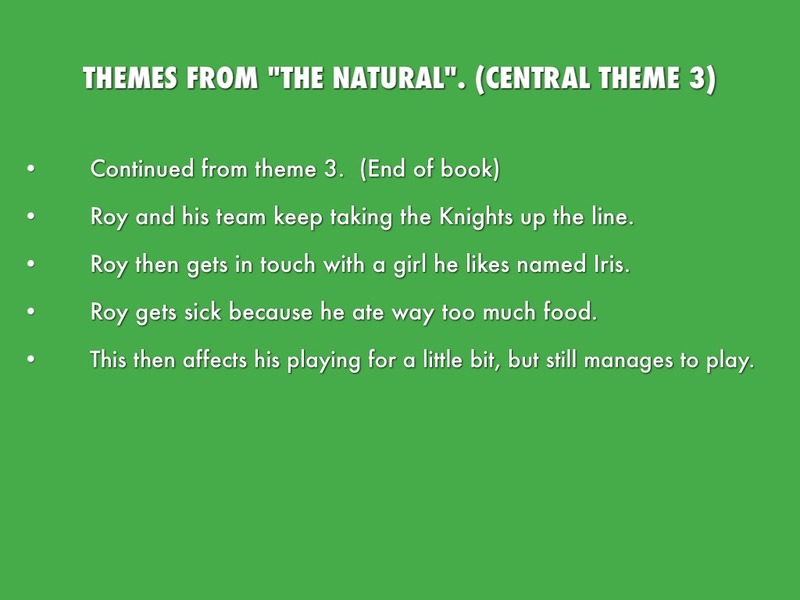 So because of that, Roy has really helped the Knights team make a climb in popularity. He has also made them a better team. The other players on his team our pretty good, but not as good as himself. 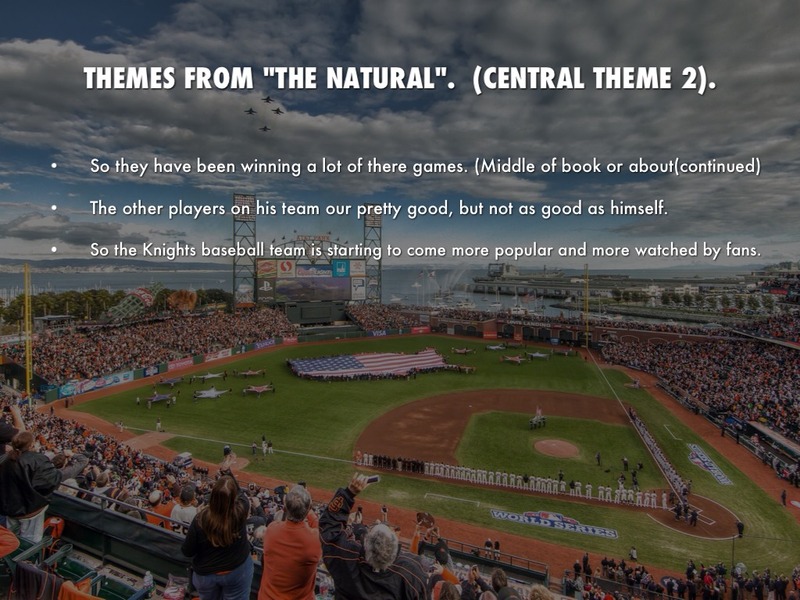 So the Knights baseball team is starting to come more popular and more watched by fans. Roy is continuing to play ball well. It is now the playoffs. 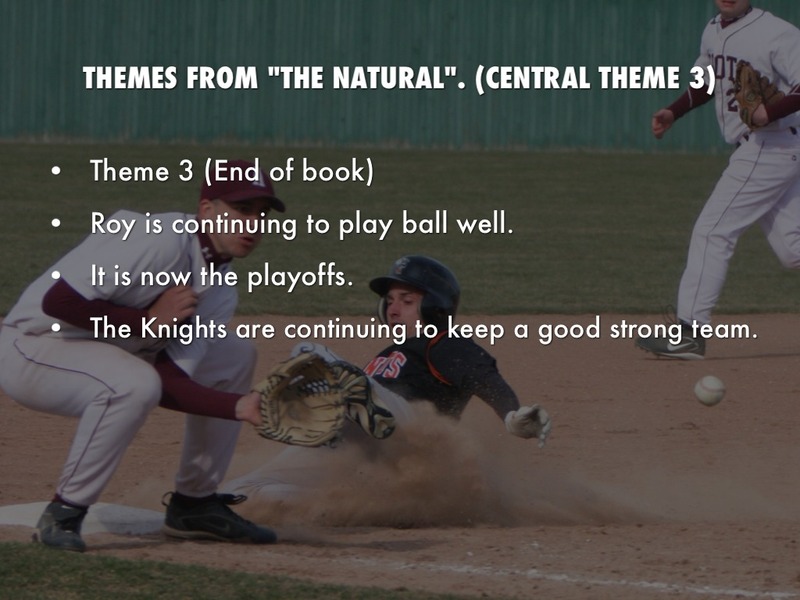 The Knights are continuing to keep a good strong team. Roy and his team keep taking the Knights up the line. Roy then gets in touch with a girl he likes named Iris. Roy gets sick because he ate way too much food. This then affects his playing for a little bit, but still manages to play. They then end up losing the last game of the season. Roy was up to hit for the last time and Strikes out. 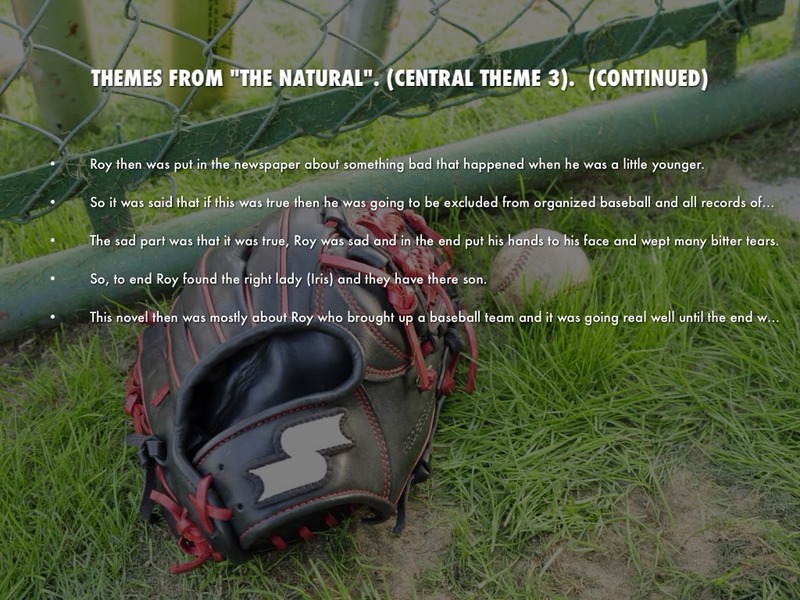 Roy also broke his bat and buried it in the field that night. Roy was pretty mad and depressed that he and his team lost the last game. He was really mad because he wanted to win it for Iris and his son to make them proud. Later that night Roy got mad at a couple of people who did not treat him right and were disrespectful. It was a guy named Gus and the judge who gave him money for playing baseball. Well he ended up going to find them, and then beat them both up. They were trying to shoot him, but there was also a girl there too that he knew, named Memo. Memo ended up getting one shot off at him and skinned his shoulder. This also ended up breaking a mirror. 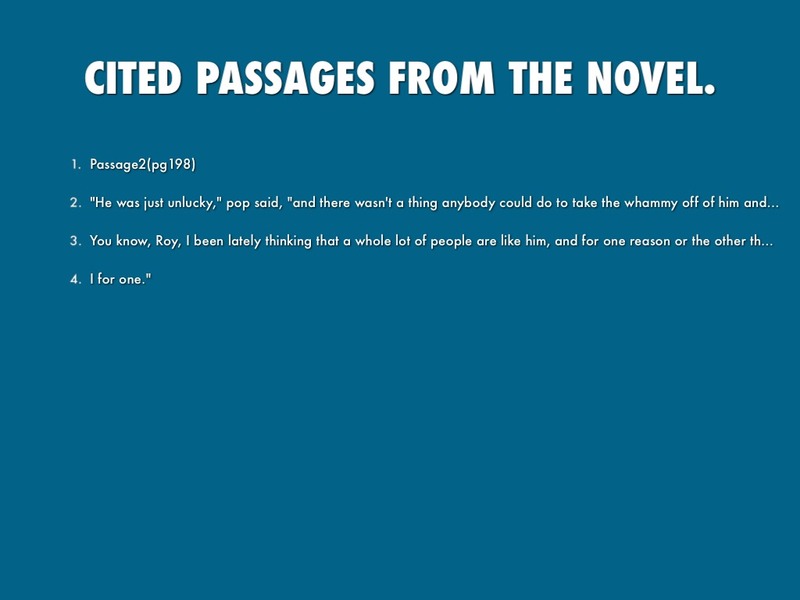 Roy then was put in the newspaper about something bad that happened when he was a little younger. So it was said that if this was true then he was going to be excluded from organized baseball and all records of him will be lost. The sad part was that it was true, Roy was sad and in the end put his hands to his face and wept many bitter tears. So, to end Roy found the right lady (Iris) and they have there son. 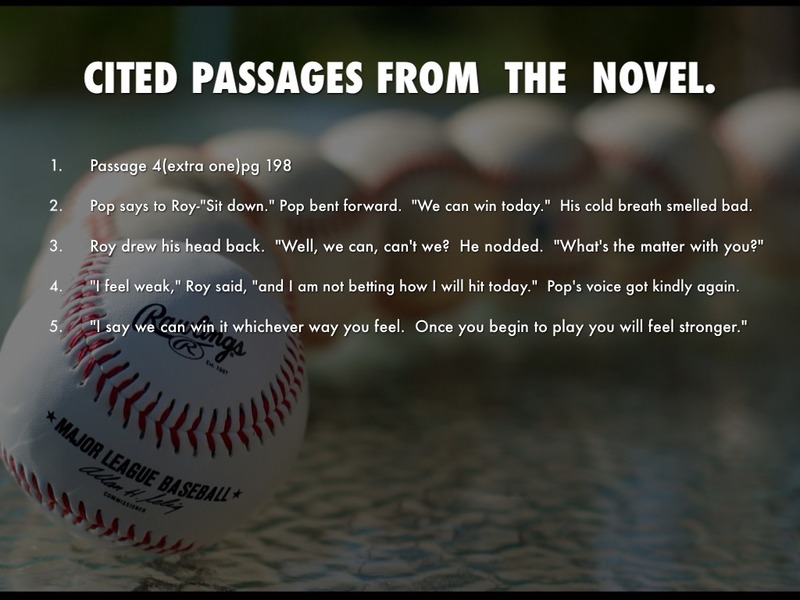 This novel then was mostly about Roy who brought up a baseball team and it was going real well until the end where he made some mistakes. He did make some other mistakes in his life before the end. 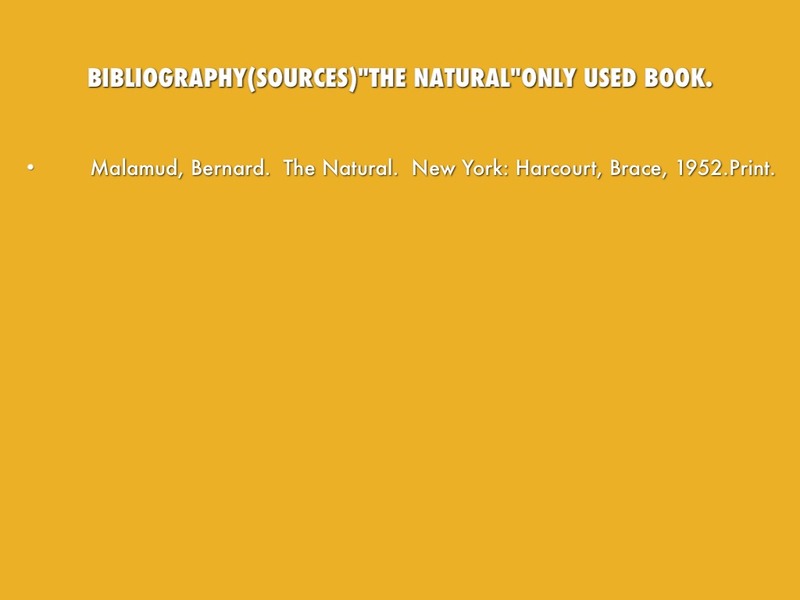 Malamud, Bernard. The Natural. New York: Harcourt, Brace, 1952.Print.